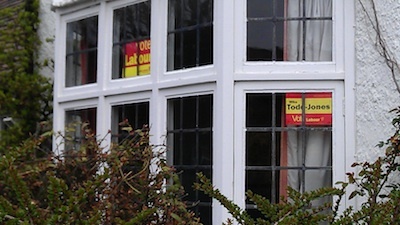 Only Sign of Elections in Arbury – Posters for Labour’s Mike Todd-Jones. 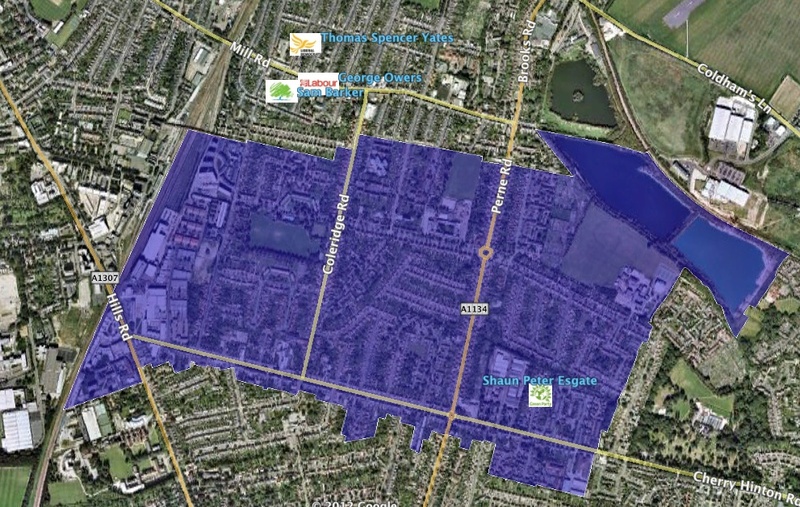 Cambridge City Council elections are to be held on Thursday the 3rd of May 2012. Cambridge is split into fourteen wards, there are three council seats for each ward. The elections in May are for one seat in each ward, so a third of the council seats are up for grabs. The names and addresses of the candidates have been published online by the council in the “Statement of Persons Nominated” available from the council’s elections page. I have mapped the candidate’s addresses and displayed them along with maps of the wards. Those wishing to get to grips with the information can view it on Google maps, and turn individual wards and their candidates on and off using the checkboxes (the topmost checkbox turns everything off, which may be a useful starting point. The wards shapes are listed below the candidates). Maps for specific wards are included later in this article, they can be clicked to enlarge. There are three wards where none of the three main parties, Conservatives, Liberal Democrats and Labour have fielded candidates who live in the ward. These are King’s Hedges, Coleridge and Cherry Hinton. 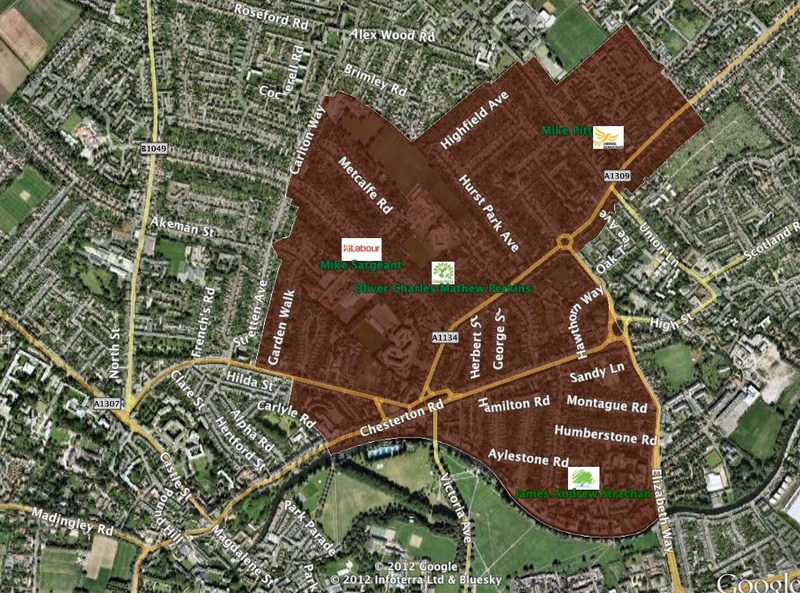 King’s Hedges is one of the most deprived wards in the city. As well as having no candidates from any major parties who live in the ward it has Liberal Democrat and Conservative candidates who live in quite different, remote parts of the city. Cherry Hinton is the only ward in which none of the candidates live in the ward (there is no one who lives in Cherry Hinton standing for election anywhere else in Cambridge either). In Kings Hedges Ian Tyes (United People’s Party) is the only candidate who lives in the ward, and in Coleridge Green Shaun Peter Esgate is the only candidate who lives in the ward. Martin Lawson, Green, from Impala Drive near the airport, standing in Queen Edith’s. Robert Dryden, Labour, from Fulbourn standing in Cherry Hinton. Jack Benjamin Toye, Green, from Waterbeach, standing in Castle. 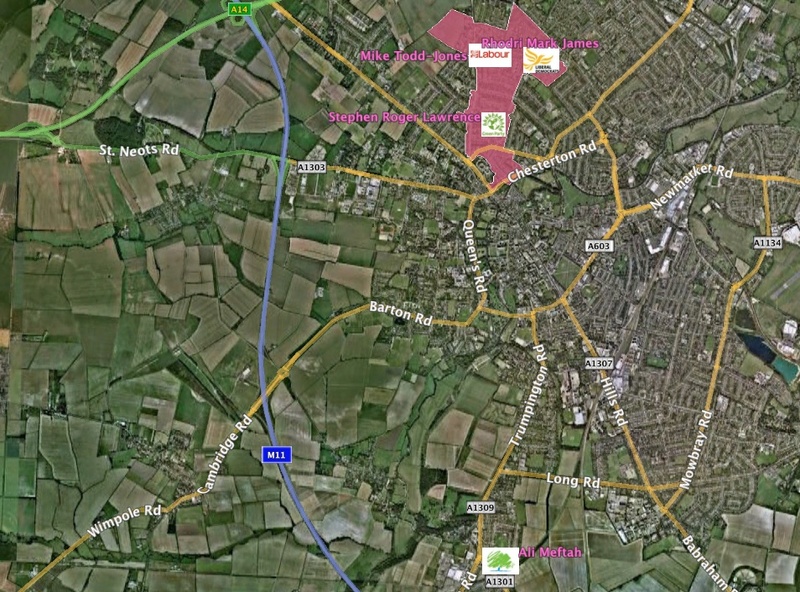 In Trumpington and West Chesterton all the candidates live in the ward. Personally I was surprised to see that Cambridge Socialist Tom Woodcock, who is standing in Romsey, as he has done in the past, has an address in East Chesterton. As only a third of the council seats are up for election, on the morning of the 3rd of May not all parties in Cambridge will be starting from a level position. As there are 14 seats up for election it is technically possible for Labour to take control of the council from the Liberal Democrats in this election, or for the council to be left without one group in overall control. My view is this is unlikely and while the Liberal Democrat’s majority might be reduced there will probably be little substantive change to the overall make-up of the council. I would prefer to see less conservatism in the system, giving elections more meaning, and the electorate more power, by holding all-up elections every time. I think that four year terms for councillors in a city with such a high turnover of population is too long. I’d rather see all council seats up for election every time we have an election, and shorter terms for councillors. As well as giving a greater opportunity to overturn the current regime, I think shorter terms might encourage younger people to stand for the council, as I suspect many of those in their twenties in the city might be less certain of where they’re going to be in four years than those who’re older and more established in terms of jobs, homes and families. One reason I didn’t stand for election in my twenties was because I wasn’t sure I would stay in the city for the subsequent four years. This is my local election. Labour’s Mike Todd-Jones is the sitting councillor seeking re-election, and Rhodri James, the Liberal Democrat has previously been my councillor so I am voting from a better informed position than would usually be the case. Mike Todd-Jones and his team have been canvassing hard in the ward already, many of my neighbour’s homes have his poster in their windows (I’ve seen no evidence of any other candidate’s posters). Mike Todd-Jones regularly carries out his “Arbury Survey”, so has some contact with the ward’s residents between elections. He would be a good local councillor in a low tech, unchanging, sleepy part of the country, but in Arbury the fact he doesn’t vote on planning applications, rarely participates in debates on setting police priorities and holding the police to account, and appears to be someone who is rather proud about the fact he doesn’t communicate via Twitter or a blog means he’s not really an ideal person to represent the ward. He doesn’t appear to have a clear vision for the ward, or the city. How he plans to keep the city working in the face of the massive expansion it is experiencing and what his views are on the development around the city are not clear from his publications and statements. Like Rhodri James did when he was a councillor Todd-Jones appears to have focused mainly on the needs and interests of those living in council housing in the ward. It appears the Conservative candidate, is just a “paper candidate” someone the party has come up with to ensure they’ve got someone standing in every ward, though I’m interested to see if they do come up with anything, and I am yet to hear anything from the Green. While Todd-Jones often tries to distance himself from the actions of the national Labour Party he appears happy to pick up the votes of those who vote locally based on national politics. My own vote might go any way, or I may spoil my paper. I’ll cast my vote based on who I think will do best for Arbury and for Cambridge. See also my comments from the 2008 Arbury city council elections. Labour’s Richard Johnson appears to be running a strong campaign here. I think he has a good chance of winning and would make an good local councillor if he focuses on what a local councillor can achieve and not on national politics. See his recent leaflet on ElectionLeaflets.org. Mr Johnson has been active in the city’s political debates for some time now, having stood previously in Newnham. He tweets. We’ve got a month to go before the election and in Abbey as elsewhere I’m interested to see what the other candidates come up with. The Conservative candidate for Abbey is their local deputy chairman Tim Haire his most recent article focused on Trumpington. The Liberal Democrats appear to have surrendered this ward to Ex Lib Dem, and Ex. Labour, now independent, John Hipkin. Cllr Hipkin (Twitter, Blog, Manifesto) provides a useful counterpoint to the Liberal Democrat groupthink on both the West Central Area Committee and planning committees. He is one of the few councillors to think strategically about the city, and while I sometimes disagree with him he often pushes debates on to the important subjects which might otherwise be missed. The Liberal Democrat’s candidate Alan Levy has been shipped in from Arbury, he clearly wasn’t the Lib Dem’s first choice in his own ward. He was very poor as a councillor when he was elected, he rarely spoke at any council meetings and never substantively participated in debate at full council. He had such a long, unexplained, period of absence that his seat ought to have come up for re-election but the Lib Dems passed a special motion at the City Council to allow him to stay on as a councillor despite not attending for longer than the period which ought result in automatic loss of office. Cllr Hipkin rarely stays to the end of full council meetings though, and his performance in the last year or so has not been as impassioned has it has been in the past. 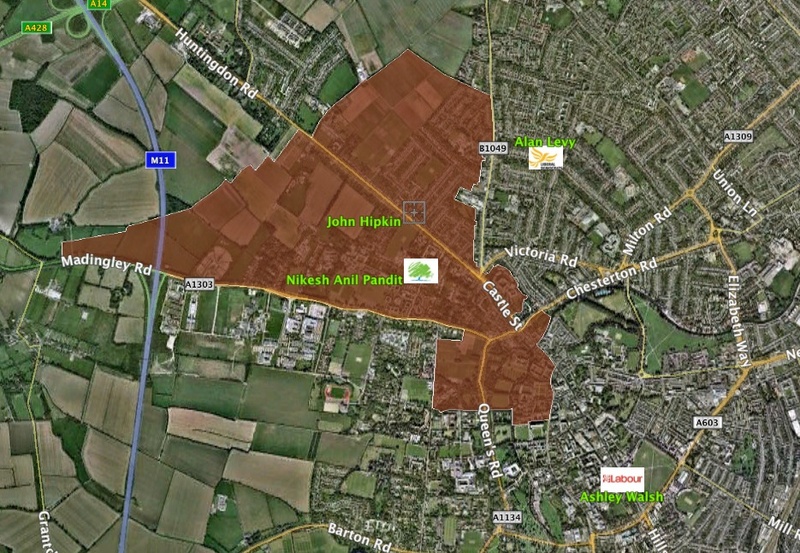 If I was in Castle ward I’d certainly not be voting Alan Levy, Cllr Hipkin is the known quantity, the green lives in Waterbeach with no clear link to the ward, and student Ashley Walsh’s election manifesto comments on the ex-Texaco garage site planning promising: “Ashley will keep residents informed about the appeal against that decision”. He could do with keeping himself up-to-date and informed first, he could do with reading John Hipkin’s newsletter which reported in March that a planning inspector had upheld the appeal against the city council’s refusal last month. Ashley Walsh on Twitter. Hipkin appears to be the only serious candidate. Here the big surprise for me was that the sitting councillor, Robert Dryden doesn’t live in the ward, though he has a long historical connection with it. I think far too many Liberal Democrats remain background figures when elected, many stay silent throughout council meetings and their only participation is voting as their leaders direct them. We need people who participate. Here the candidates from the three main parties live near the ward, but not in it. I think in some cases, if candidates work in a ward, or spend a lot of time in a ward then standing somewhere other than where they live is acceptable. When people live miles away from where they represent though I think they lose or lack a connection with the area which is necessary to represent it effectively. Cllr Owers (Twitter), a history research student, has in his short time as a councillor shown himself to be a passionate local councillor and while his contributions at full council meetings have been rather heavy on the national politics he has provided some much needed life and vigour into proceedings. He once accidentally addressed the mayor (who chairs council meetings) as “Mr Speaker”, he participates in full council debates (something which is unfortunately notable for a councillor! ), and has a habit of stopping immediately, even mid-sentence, if told his time is up. Here we have three candidates seeking to represent a residential suburb they have to go out of the city from where they live to visit. I think this is different to someone standing to represent the city centre when they live just outside the Market Ward. 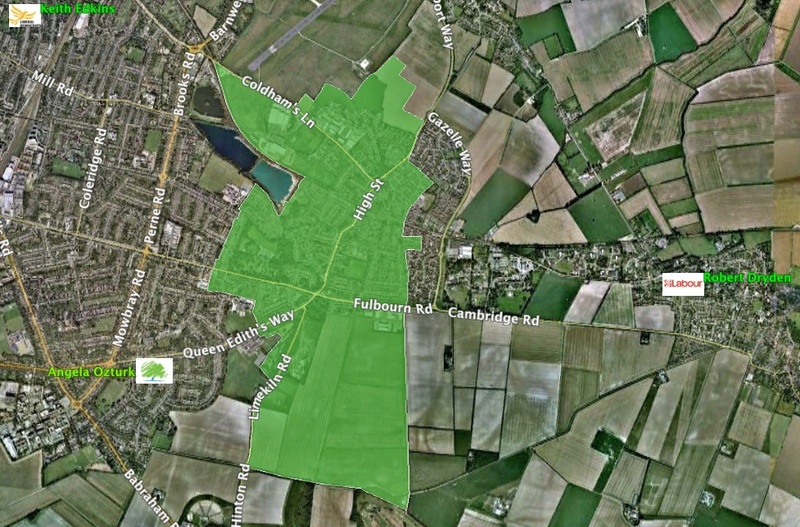 I think there’s a slight parallel with Kings Hedges where we have candidates living in richer, nicer parts of the city seeking to represent the poorer and more troubled parts (though as with almost all wards in Cambridge Coleridge is very mixed and there are richer and poorer, good and bad, streets). East Chesterton regularly appears to elect poor quality councillors, as far as I can see from the current candidates there’s no sign of this changing. I believe the Conservative is probably the Mr Francis who attended a North Area Committee meeting in 2010 to comment on the lack of visitor parking for the Vie development. Cllr Neil McGovern (Twitter) is a reasonable local councillor, but now he’s moved to the city centre I question if he’s still the best person to be representing King’s Hedges. I wonder why people in the ward can’t find someone who lives there to represent them. For those wishing to read about the one candidate who does live in the ward, Ian Tyes, I found this rather unusual biography. The Liberal Democrat Executive Councillor for policing, Liberal Democrat Tim Bick, is seeking re-election. This is a student heavy ward, and the Liberal Democrats have, as a party, broken their promise to oppose the increase in tuition fees, this is probably the ward where national politics is most likely to have a substantial impact on the city. Cllr Bick promised a gate to control vehicular access onto Midsummer Common when he was seeking election four years ago, despite a period when he claimed this was no longer desired by residents, one has recently been installed. Cllr Bick struggles balancing the liberal principles on which he was elected with lobbying from the police and some businesses for a more authoritarian approach to policing central Cambridge. Cllr Bick recently said he would be prepared to consider a regime to limit freedom of movement in Cambridge. Cllr Bick is on Twitter but hasn’t yet tweeted. Council leader Liberal Democrat Sian Reid is seeking re-election. I suspect there is little realistic chance of a decapitation, her politics of “Shop doors” and “Residents’ Associations” appears to go down well in Newnham. Though it is notable that the current Liberal Democrat manifesto for Cambridge has dropped any mention of Resident’s Associations, recognition and consideration of these groups used to be a key part of the party’s offering despite them rarely being inclusive and representative. Active liberal tweeter Zoe O’Connell is standing against Labour’s Gail Marchant-Daisley. This is a ward where unfortunately someone who’d make a great councillor isn’t going to be elected; if only we could re-distribute the passion and ability around the city. 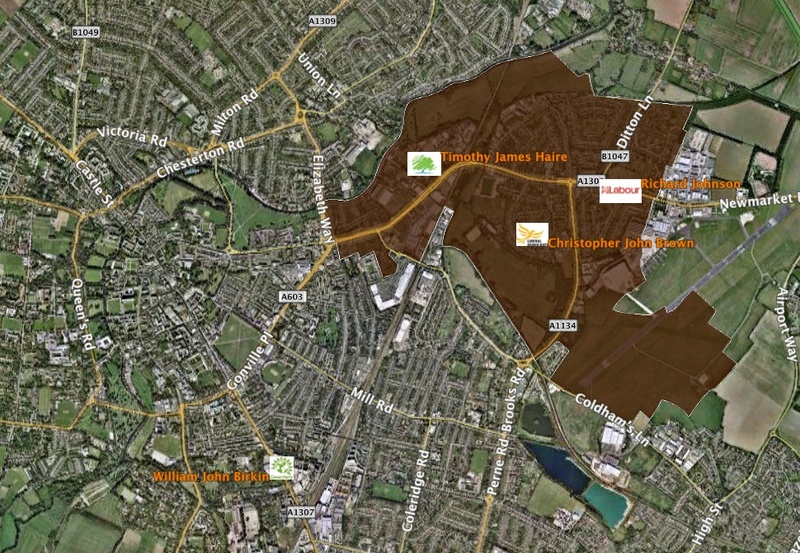 I am slightly concerned that O’Connell’s liberal beliefs and principles might not survive the transition into power though, as as of the time of writing there has not been any response to my question on which way O’Connell would vote on dispersal zones which many of Cambridge Liberal Democrats support. Liberal Democrat Cllr Amanda Taylor (Twitter) is seeking reelection. She has a substantial record on which residents can judge her performance. She is an active councillor I’ve often written about her contributions. The biggest surprise here to me was to find that Tom Woodcock (Twitter) does not live in the ward he regularly stands in. Perhaps he’s chosen Romsey because he thinks that’s the ward in Cambridge where a more extreme socialist than a Labour party support stands the best chance of getting elected. The Liberal Democrat councillor, and candidate, Cllr Smart isn’t particularly impressive, she is deputy leader, but in the absence of the leader of the council at the recent budget setting full council meeting gave no speech when introducing her party’s proposed budget for the city. With the socialist vote here being split between Mr Woodcock and the Labour candidate from the other side of the city I think it’s likely Cllr Smart will be returned; but has with many of the city’s wards, the result could go in any direction following a decent campaign. One of the most inactive Liberal Democrat councillors, Cllr Al Bander is standing for re-election. Cllr Al Bander is the council’s cycling champion, but I’ve never heard him speak on the subject despite attending many meetings about improving cycling in the city. Cllr Al-Bander has only made one contribution to a full council meeting, noting a black sailor from 250 years ago with a link to Cambridge. Liberal Democrats give their non-speaking councillors a round of applause when they finally make a contribution, often years after they get elected, Cllr Al Bander got his in July 2011 after being elected in May 2008. His contributions at South Area committee meetings are often off-topic. If I lived in Trumpington I’d be investigating other options. I suspect this is one ward the Conservatives could win, but they have very little presence in the city. The current Mayor, Ian Nimmo-Smith is not standing for re-election. The Liberal Democrats are putting up Mike Pitt (Twitter), who lives in the ward, but previously represented Kings Hedges. Cllr Pitt was one of the better Liberal Democrats at the North Area committee when he served as a councillor. As a maths teacher he is capable of basic arithmetic, a skill which it is often useful for at least someone round the table to have at council meetings. Cllr Pitt also appeared, unlike many of those elected as Liberal Democrats to care about civil liberties and due process, he to some degree followed up a number of concerns in these areas which I raised using the public speaking slot at the North Area committee. 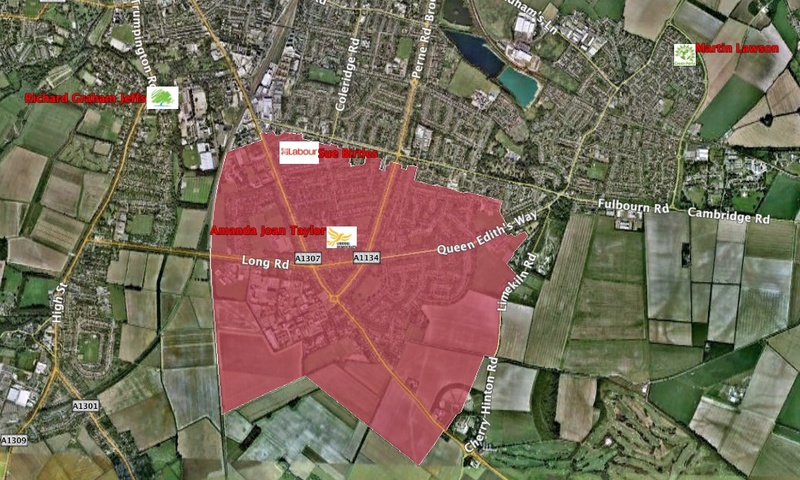 The Conservative candidate, James Strachan, though has opposed the extension of controlled parking (and the associated extra tax) to the De Freville area, which the Liberal Democrats have broadly supported. I think this is a signifiant issue in the ward, and while West Chesterton has previously been a Liberal Democrat stronghold, I think Mr Strachan stands a good chance of being elected. It’s not just candidates who sometimes don’t live in their wards; from time to time councillors move away after being elected. Currently two of Cambridge’s youngest councillors are representing city wards while living our of Cambridge. Liberal Democrat Cllr Sarah Whitebread represents Central Cambridge’s Market Ward on the County Council while living in Stapleford. Green Cllr Adam Pogonowski represents Abbey on the city council while living in Rampton. Both have declared aspirations to return to live in Cambridge, but councillors are not immune from the pressures of jobs and housing costs which affect many others. In recent years Arbury continued to be represented by Liberal Democrat Rupert Moss-Eccardt for a few months after he moved from the ward to Ely, and Liberal Democrat Gaynor Griffiths continued to represent Market ward for a period after she too moved to Ely. The Liberal Democrat Manifesto for the 2012 City Council elections (PDF) contains lots of promises to do things which have already been approved or agreed, this is a cynical way of campaigning. It also contains the line “We have Saved the Alexandra Gardens trees” those who were following events know is complete nonsense, local residents had to campaign against the Liberal Democrat run council, and it was the Liberal Democrat run council which was threatening the trees in the first place. Cambridge Conservatives and Cambridge Greens have made their local policies available on their websites. I think we have a healthy and thriving democracy here in Cambridge. A full set of contested elections, with each seat being contested by at least three, and in most cases four candidates is fantastic. There’s a lot more we could be doing better though; more openness, greater awareness of what local councillors can do, and are doing, as well as electing better quality councillors with more strategic vision. Thanks to Lucy Price for helping transcribe the candidate data, MySociety’s MapIt for the ward boundary data and Google Maps. Sorry, I can’t agree. The policies of the prospective candidates is way more important as they affect what will happen in council meetings and impact on residents. As long as they do a job, engaging with their ward, sorting problems out, raising issues etc etc, then I’m not fussed where they live and I’m a bit irritated about the carping that’s gone on elsewhere about it. I don’t know what cobweb is disagreeing with. I too would like to see a greater focus on candidate’s policies. I’ve said I would like to see some more strategic, city wide, thinking from candidates and councillors. I think a connection with the ward they represent is valuable though, so that they can understand the issues better, after all they will be setting the local police priorities, deciding which minor changes to streets and public spaces get made etc. 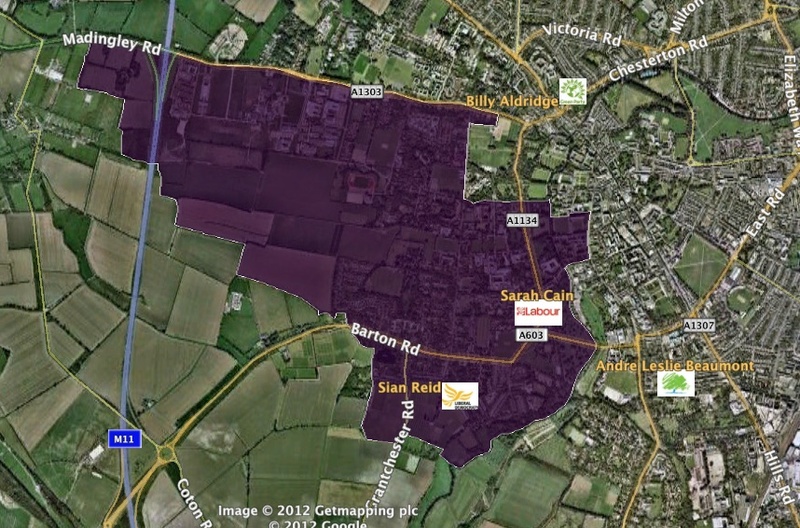 My ward of Arbury is currently represented on Cambridgeshire County Council by Labour’s Paul Sales, who lives in Burnside – off the far end of Mill Road. When he visits his ward for the occasional public meeting I feel he is often out of touch, he lacks the experience of walking or cycling in the area on a daily basis that those who live in the area have. 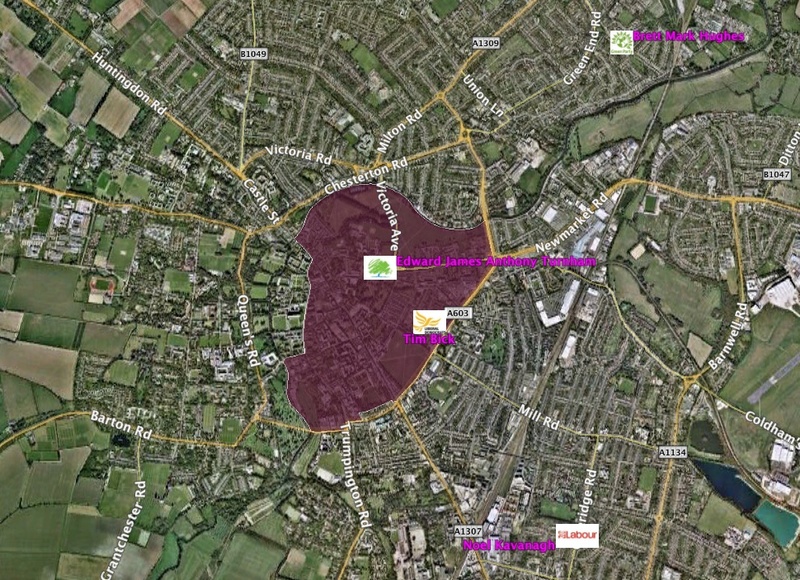 Perhaps we’re asking too much of our local councillors, to do both the hyperlocal (eg. street by street litter, dog poo and parking issues) and the strategic – setting the city up to cope with massive expansion in population? I don’t think that’s the case though, I think a connection with local things helps inform better big picture decision making. Perhaps if each councillor had a smaller ward – a third of the current size, with one councillor per ward rather than the current three it would be easier for them to keep on top of ward based issues, and easier for them to keep in touch with a smaller number of constituents. I would be in favor of such smaller wards for this reason, as well as simplifying matters. In my experience relatively few city residents are aware we have a system of three councillors per ward, it’s unnecessary complexity. I agree and disagree with Richard. In my experience you need regular exposure and contact with the ward or division to be able to represent it. That does not mean you have to live there. It might be as good to work there, perhaps sometimes better. And I don’t think that attending Council meetings is a good measure of a Councillor. Yes, meetings where local things are discussed (planning, Area Committee, AJC! etc.) should be attended, but actually doing the legwork beforehand is much more important. Helping people and speaking for them and up for them is what being z Councillor is about. Speaking at Full Council is not. Richard, I would be willing to bet that 99% of Arbury residents do not care that Mike Todd-Jones does not have a blog and does not use twitter. Indeed, half of my neighbours do not even have a computer. Having said that, Rhodri James seemed like a perfectly amiable sort when he was on the council, and I was surprised when he lost his seat. Unlike Newnham, where Sian Reid probably is a shoe in, Arbury is not yet full of the sanctimonious middle class (i.e. rich) people who dominate Cambridge, and I imagine this time around Labour will again win in Arbury, if nothing else because of the dreadful ConLibDem national government. I seem to remember that the Tory candidate used to live in Arbury, which is possibly why he keeps being put forward. Obviously the Tories (and Greens) are no hopers in Arbury. I agree with cobweb, I don’t really care too much where the councillors live, although I have to say I think they ought to at least live in Cambridge. I am surprised that you are impressed with Neil McGovern. The one North Area committee meeting I attended the last few years was about the new city council planning website. I talked with him afterwards (because one of the other Lib Dems told me he was the person to speak to) and he had no clue what was going on with the new website (it was not working properly) and he seemed to have no interest in what was going on. (I seem to remember that he was in charge of IT strategy for the Lib Dems at the time.) Fortunately the new planning website gremlins were eventually sorted by the city. Unfortunately, the planning data is still not being released freely into the public domain, because it seems beyond the capability of our Lib Dem councillors to force the bureaucrats to do this. I think you are breath-takingly unfair on Mike Todd Jones. He is the hardest working cllr in Cambridge politics by some distance. Your perspective is warped by putting so much emphasis on a) area committee meetings (a small part of a councillor’s duties) and b) social media. Mike believes in face-to-face interaction and I have never known anyone work so assiduously, knock on so many doors and do so much casework. He doesn’t focus just on ‘those living in council housing’, and making that distinction has a slight air of snobbery to me. Look at the work he did on the Alexandra Gardens trees issue, to take one example, or his highly detailed submission on the Histon Rd garage application. To be honest, you really have no idea of the amount of work Mike does. You only need to look at the fact that he won in 2008 against the overwhelming national tide, and the strength of his massive personal vote in Arbury to realise what a dedicated councillor he is. I wouldn’t normally comment, but I feel so strongly that Mike is perhaps the best and most caring cllr I’ve ever met, and you have completely misrepresented him because he has a different style from you. I was critised by the Conservative deputy chairman Timothy Haire for not being aware he was behind the anonymous “Radegund” Twitter account and not including him this in the article and its associated tweets. Liberal Democrat Tim Bick is included in the above list even though he is yet to Tweet. 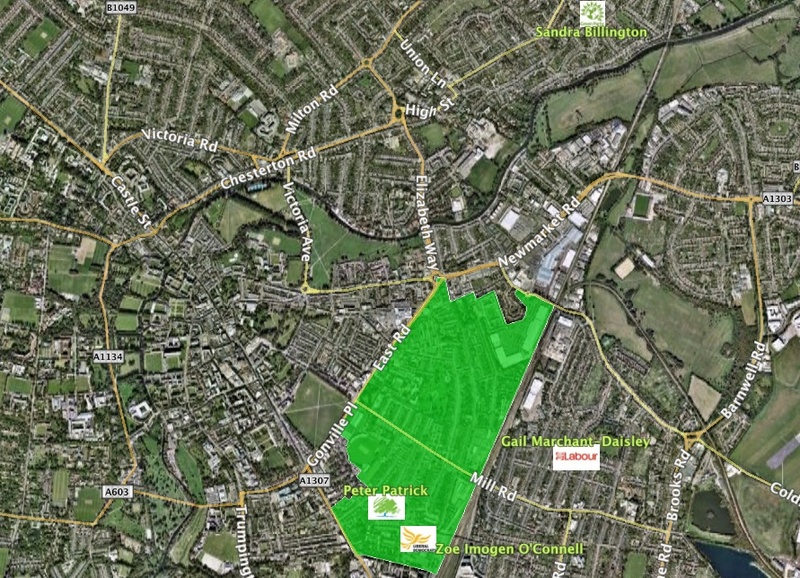 I’m not sure if Cllr McGovern (IT) or Cllr Ward (planning) is responsible. I think Cllr McGovern is aware of what’s needed but he’s more of a pragmatist than someone like say Jason Kitkat in Brighton. I agree Cllr Todd-Jones is a dedicated councillor, but if your argument is I don’t know enough about what he does I’d say he needs to do more to communicate what he does his constituents, I do my best to follow what my representatives are up to – they need to report back. I think my profile in the Lib Dems will be somewhat enhanced when I am elected as our first councillor in Cherry Hinton, and my biography will be rephrased as necessary. Having said that, I do not look forward to sitting through council meetings if every councillor feels obliged to speak on everything – I understand they often go on too long as it is. I feel I should defend Keith here. I like the modest understatement of the phrase ‘unimportant background figure’. I think you read too much into flippant remarks sometimes Richard. It’s being reported nationally that the LibDems are struggling to find candidates; it may be we’re seeing this locally too, with Cambridge Libdems putting up “unimportant background figures” who don’t live in the relevant wards to ensure they’ve got someone standing everywhere? This is hardly the first time that Keith has stood for the Lib Dems in a ward they didn’t expect to win. In fact, the first time was 1973: http://www.crosenstiel.webspace.virginmedia.com/camelect/candse_g.htm#E. His current score is 0 out of 9 (http://www.crosenstiel.webspace.virginmedia.com/camelect/misc.htm#cand7), though he doesn’t yet rival the remarkably persistent Margaret Wright, who was defeated 19 times before finally being elected for Abbey. 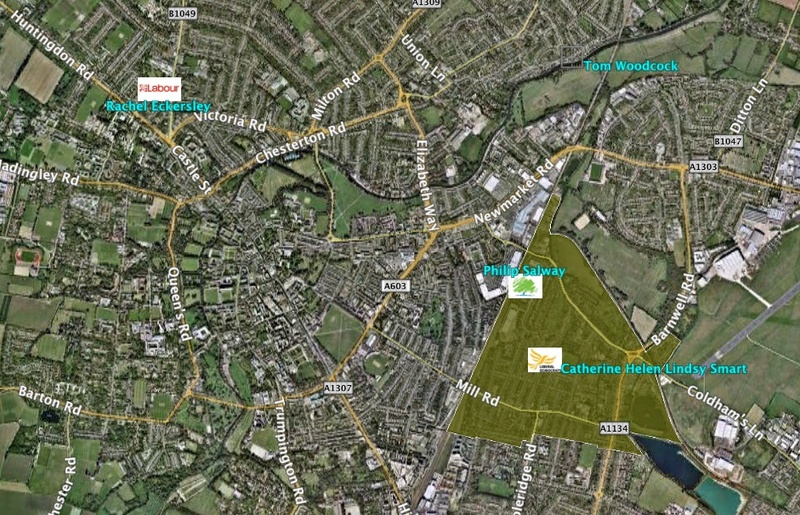 Impala Drive is only “outside the city” in administrative terms; as far as the residents are concerned, it’s very much part of Cherry Hinton. That’s just one of a number of daft political boundaries in this city though, with the whole of Queen Edith’s being outside the Cambridge parliammentary constituency as the main absurdity. Interesting write up Richard. Though many are correct that your understanding of what a Cllr does is still lacking – and the importance you place on social media and speaking at Council meetings is part of this. Do you have a prediction for the result? Agree with comments about Mike T-J, I’ve got a lot of ti me for him. Phil Rodgers: In Coleridge in June 1973 I even had a realistic chance of winning, as we had taken the County seat in April. As it fell out, the electors chose the 4 people (from 3 parties) who they had heard of. There may be a lesson there. It was a different ward then, containing a chunk of modern Queen Ediths. Cllr George Owers: Thank you. We can’t all be prima donnas, after all. To clarify, are you complaining about the principle of cycle improvements on Gilbert Road (i.e. removing car parking from the cycle lanes), or just the traffic calming element? Hello Martin, I was referring only to the traffic calming. Although I should perhaps add the following. Personally speaking I was not even for the removal of parking from Gilbert Road because I never thought of that as being dangerous (and I have cycled Gilbert Road twice a day, most days, for more than almost twenty years). But I know that many unconfident cyclists (and even confident cyclists, who have kids) thought otherwise. How much of that is the result of a real danger and how much of that is down to the continual over emphasis and fear mongering by the media in this country of very low probability dangers (e.g. of being hit by a car, or of one’s children being kidnapped by a stranger) is hard for me to judge. I assume the council will continue to measure accident stats and that we will hopefully find out in a few years that they have vastly reduced on Gilbert Road (although they were already low to start with). Of course looking at comparative stats one always have to remember the caveat “all other things being equal”, which they never are in cases like this. And unfortunately the people gathering and publicising the stats have an agenda to prove that what they have done has worked, so one has to be wary of what they report. Romsey candidate Tom Woodcock asked me to include his twitter name in my article which I’ve now done. As for the city boundries I’ve commented before suggesting the city’s boundries need extending. 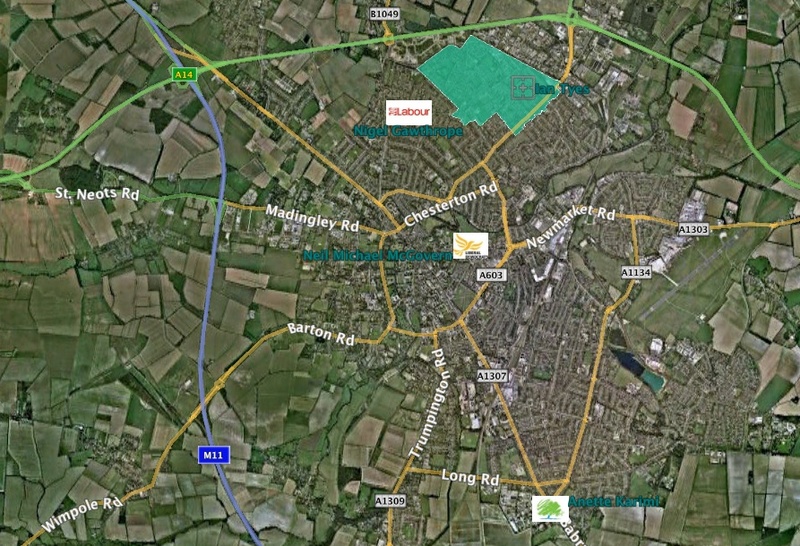 Responding to Cllr Manning – I’ve written about East Chesterton councillors previously. We’ve recently had Clare Blair, elected as a Liberal Democrat but supporting illberal policing once elected and after being booted out by the electorate switching to the Labour party – her views on housing and policing were always more New Labour than related to any Liberal Democrat manifesto or policy. Two liberal democrats have complained about my view of what a councillor does, or which are the most important elements of a councillor’s role. I don’t understand the argument participating in council meetings isn’t important; some make it for MPs too – but there as well I’d like to see more Parliamentarians, people who focus more on the main job. Thank you for this, Richard, it’s interesting. I think calling Coleridge (my ward) “a residential suburb [candidates] have to go out of the city from where they live to visit” is over-egging it a bit though. I do live on the Mill Road side of the ward, and perhaps I’d feel differently if I lived on the other side of Coleridge, but to me living less than five minutes’ walk from the ward seems near enough. Richard, you’ve written about Clare Blair a lot before. You made a statement about East Chesterton regularly electing poor quality cllrs, but haven’t provided evidence for this. Also, I’m really interested in your prediction for the result. Lib Dems struggling to find candidates? Not so here. 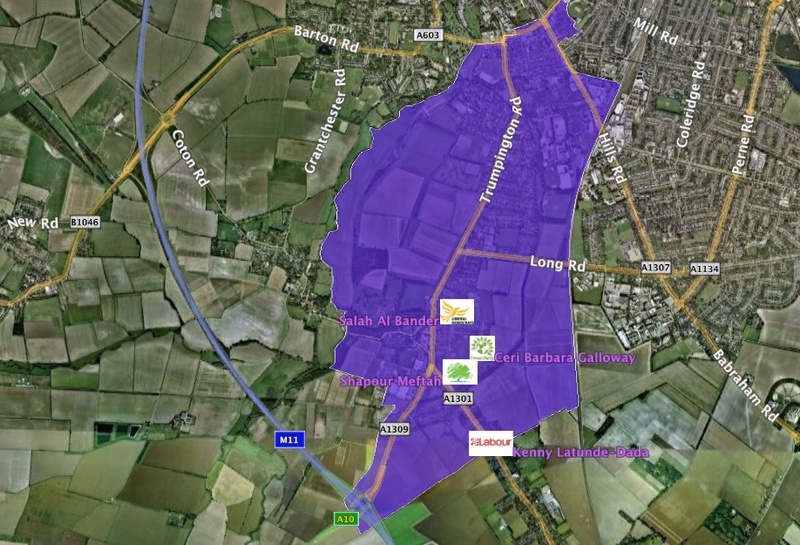 We have a full slate both for Cambridge City and South Cambridgeshire District Councils. Richard I did not criticise you for not knowing who was behind my twitter account I merely pointed out in the first instance that it was missing from the list of candidates who tweeted. When you pointed out it was anonymous I pointed out I had never made a secret of who’s was behind the account; whenever being asked the question who was behind the account I have responded with my name. Anyway disagreements about this aside keep up the good work. I live in east Coleridge, and I’ve seen more of George Owers in Coleridge ward then I’ve seen of any other councillor for Coleridge ever. Your information, comments and views are – as always – interesting. The City Council has little involvement in the major aspects affecting Cambridge – it’s about time we had a unitary authority and got rid of the anomalies! The Arbury Conservative candidate’s leaflet was delivered to me this morning. I have made it available on ElectionLeaflets.org. This is highly misleading as the map shown in the article above illustrates. Meftah is from Trumpington in the South of the City, about as far away from Arbury as you can get while remaining within the city. The last Conservative to hold an Arbury ward seat on the City Council was Vivian Ellis in 1992 (Ref), that’s twenty years ago. As for policy it leads with “Right to Buy Strikes Back”. It states that council housing sold off will be replaced with new affordable homes built with the proceeds of the sales. It notably does not though state these would be new council homes. There is no mention of any policing and crime related matter. It focuses largely on county and national matters. It includes a criticism of the Liberal Democrat’s use of development taxes, which I agree with, it states: “This money is ultimately a tax on hard-working people wanting to buy their own homes”. To be fair the family do have links to Arbury with relatives still living and working in the ward. It is remarkable for the total absence of Arbury-specific material and no mention of one of the things that will have a direct effect on the ground, namely the removal of all parking on Histon Road for no real benefit. The Histon Road parking removal may well increase speeds on the road and make it less safe for cyclists. Parking removal to make way for proper cycle provision might have made sense. I too can’t see what parking removal alone will achieve, other than a few seconds saved by buses which are expected to be able to travel faster. Richard/Rupert, I saw the recent Cambridge News Story about the changes the county council wants to make with regards, to parking on Histon Road, etc. I did not manage to find anything out about this on the county council website, but I always find that website to be totally unusable. I emailed Paul Sales, the Arbury county councillor, but did not hear back (possibly the email address was out-of-date, although it was from the Labour website). When was the public discussion of these changes, and can anyone point me to a document about them (including maps)? It’s not just the end of parking on Histon Road that is strange, it is also the proposal to allow buses to travel through the middle of the Mitcham’s Corner island (the way I understood the Cambridge News article, anyway). Both of these proposals will be bad for cyclists, and for very little benefit (even for bus users, who this is allegedly for). 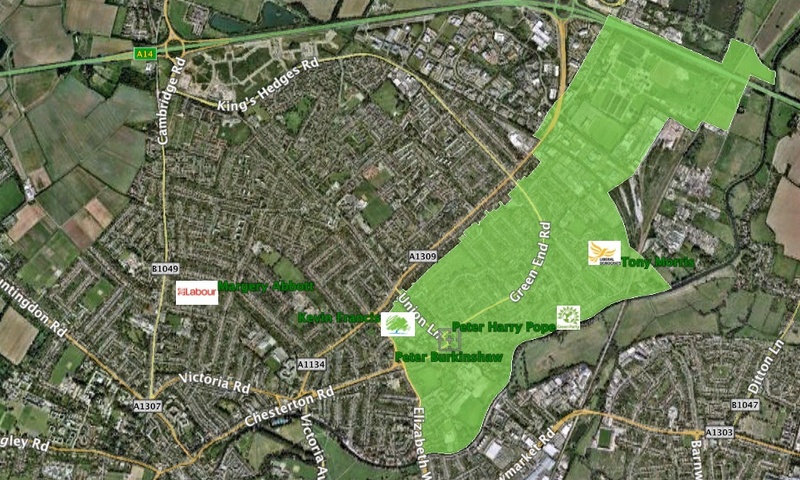 And where do they expect the people at the southern end of Histon Road to park? I imagine people living on the side streets are not going to be amused to find yet more people trying to park there. Which political parties support these proposals? Just the Tories?? As I understand it the proposals were in the bid for the better bus area fund, a bid which has now been successful. The submission is available on the County Council website. The details are yet to be discussed locally at Area Committees, or the Traffic AJC as far as I’m aware. So some council officers are pushing their perpetual anti-private vehicle agenda – that doesn’t mean “the Tories” are supporting it in Cambridge. Certainly I would expect the ideological stance of the Lib Dems to fall in line with this idea – or is there some opportunism going on? Richard, thanks for the links, that explains a lot (there are no detailed plans, e.g. of the Mitcham’s Corner proposal, but I guess one wouldn’t expect those yet). Andrew, the press release that Richard links to above quotes Ian Bates (Tory who represents Fenstanton and the Hemingfords, and Cabinet Member for Growth and Planning) as being on board with these proposals. Does he have any idea what he is supporting? Obviously the Tories run the county council so it will be up to them to decide what exactly goes ahead, but presumably the bid document that was submitted has to be followed to some extent. I would hope that the politicians would at least have somewhat vetted the document before it was submitted. The politicians should be telling the bureaucrats what to do, not vice versa (the city council has had this problem with the tree department the last few years, where the politicians seem to have had no control over the bureaucrats). Just to be clear that the Better Bus Fund is County Council proposal, worked up through meetings with members such as Cllr Ian Bates and also with the City Council and South Cambs. It is most certainly not just some random officer proposal and will have been through several committees and before members several times before beiong submitted. The proposals orginated in the Joint Transport Forum. Andy is entirely incorrect in saying it is officers and not members, including Cllr Bates, at County supporting their proposals. Weak, officer-led politicians *always* claim that they are not led by the officers. I choose to decide for myself whether I am convinced. Regardless of party.